Zhang Yimou's blockbuster "The Great Wall" raked in 470 million yuan (US$67.68 million) in three days but a film critic was so disappointed that he said the filmmaker is "dead." The film, starring Matt Damon, Jing Tian and Andy Lau, is a Chinese spectacular adventure of a Chinese mysterious army fighting off monsters on the Great Wall. It is the largest scale Chinese-American co-production ever made with a US$150 million budget. It became an instant box office phenomenon after last Friday's release, exciting the Chinese film market which has been lukewarm for a long time. The opening weekend box office gross made it the second largest opening in the world last weekend, only second to "Rogue One: A Star Wars Story," which grossed US$290.5 million worldwide. But China's film critics were not thrilled. Although many said the film achieved blockbuster standards, many others put out negative reviews for "The Great Wall," calling it fails to develop convincing characters and lavishes on special effects and Olympic opening styled phalanxes. On Chinese film rating site Douban.com, the rating of "The Great Wall" has gone down from 5.8/10 to 5.4/10 thus far. One critic, who has the internet alias of "Blaspheme Movies," used extreme language in his social media post expressing huge disappointment, "Zhang Yimou is dead!" Later he explained that he didn't mean to curse the director but actually meant that the filmmaker's artistic career is almost over after making such a poor film. His comment angered Zhang Zhao, CEO of LeVision Pictures, one of the film's major producers. The executive fought back on social media saying "hiding in the sewer to attack a Chinese film" is rotten. LeVision Pictures also followed through to throw a legal warning letter on the film critic accusing him of defamation. LeVision Pictures trying to contain and control the bad reviews spawned a new round of controversies online as the public debated whether the extreme expressions qualified for free speech or just a conspiracy to belittle the film and the filmmaker. 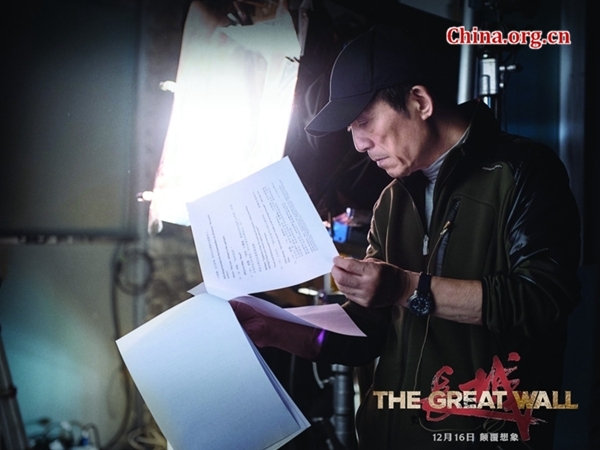 Zhang Yimou has remained silent regarding the negative reviews as he always has done. But his wife Chen Ting cried out on social media: "The director worked very hard for the film and isn’t bothered about any unfair treatment. But he doesn't deserve the curses and personal attacks like this without any bottom line. He just made a film. Where is your conscience?" Zhang Yimou's blockbuster "The Great Wall" raked in 470 million yuan in three days but a film critic was so disappointed that he said the filmmaker is "dead."